When it comes to juicers, there are two types of models which work in completely different ways. A masticating juicer is slower and usually extracts the maximum amount of vitamins and minerals from the produce. A centrifugal juicer makes juice which has fewer nutrients (due to heat build-up) and with a shorter shelf life than the masticating model. The Aicok Masticating Juicer is reasonably priced and is used to extract juice from a variety of fruits and vegetables. This multi-purpose unit makes an excellent addition to the kitchen of today which is geared towards healthy and nutritious food. It is not included in our juicer article, but it comes close to making it into our top 5. The Aicok Masticating Juicer is equipped with an auger which operates at 80 RPM. As a result, this permits the juice which is extracted to retain more vitamins, minerals, and nutrients than those of a centrifugal juicer. This should also give the juice a longer shelf life, allowing you to refrigerate your juice and not have to consume it immediately. Additional advantages include minimal foaming and no clogging. If health and nutrition are a priority, then the masticating juicer is the way to go. Another advantage offered by the Aicok Masticating Juicer over the centrifugal counterparts is that it has a higher juice yield and pulp which is drier. This is accomplished by the squeezing method and the reverse function, which is a much more efficient way to extract juice than the centrifugal method. Subsequently, this will lead to a juice which is not only more nutritious but full of rich flavor. Logging in at less than 60 decibels of noise, the Aicok Masticating Juicer is one of the more quieter juicers on the market, allowing you to cut down on your household noise pollution. This unit is easily assembled and rather simple to operate. The parts of the Aicok are safe for the dishwasher. Therefore, cleanup should not be too much of a hassle. This machine has a stable and solid design, ensuring that your juicing work runs without a hitch. There are two minor drawbacks to the design of the unit. The feed chute is a bit on the narrow side (increasing the time to prepare the produce), and the black body shows liquid marks and fingerprints and may take some time to properly clean. 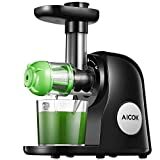 With a retail price of approximately $120.00, the Aicok is one of the more affordable masticating juicers on the market. Even though it is lower in price than some other machines, all in all, it is a high-quality unit which should have you making delicious, nutritious juices for some time to come. It is easy to operate and clean and runs quieter than many other juicers. If you are looking for the most out of each glass of squeezed juice, then the Aicok is worthwhile in considering as an addition.